This hotel is located in the very heart of the city center. The Ramada Hotel City Centre Salzburg is within walking distance from many famous places of interest, including Mozart's birthplace, the Hohensalzburg Fortress, the Getreidegasse, St. Peter's Monastery, the Salzburg Cathedral, the Mirabell Castle and Gardens, and numerous halls where festivals are held. 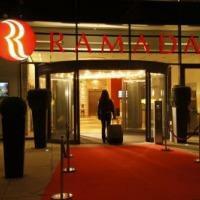 The Ramada Hotel City Centre Salzburg is located in close proximity to the Salzburg airport. Public trains and buses are plentiful, as are taxi services. The hotel is located beside the train station, but most places of interest in Salzburg are within easy walking distance. Each of the 120 guest rooms in the Ramada Hotel City Centre Salzburg are appointed with en suite baths that provide hair dryers and complimentary toiletries. Rooms are all equipped with satellite television, wireless Internet services, direct-dial phones, and alarm clocks. The Ramada Hotel City Centre Salzburg is a modern establishment that offers many amenities. For entertainment, a restaurant and a terrace bar are located on site. Guests can relax in the fully equipped fitness center, complete with saunas, steam baths, tanning, and massage services. For business travelers, conference rooms and high-speed Internet are available.